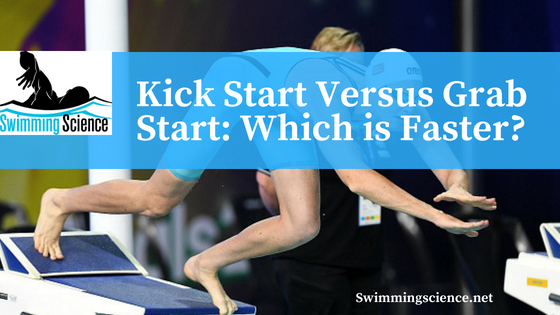 Blog Swimming Kick Start Versus Grab Start: Which is Faster? When the back plate was approved by FINA in 2009 many studies were performed to determine the benefits of using the back plate for a “kick start” (KS) versus a standard track start (TS). The majority of these studies concluded that the KS was superior in take off velocity, block time, flight time and time to 5 m – 15 m.
Fewer studies have examined the potential advantages of the KS over the two-feet-forward grab start (GS). Does the KS maintain its superiority? Read below to find out! Want more information on how to improve your swimming start? Click here. 9 elite swimmers were selected for the study. Each preferred the kickstart and had previously trained and competed using the grab start in the previous year. Each completed 10 starts plus a glide. The trials were videotaped using 4 high-resolution cameras: one placed at 5 m was used to calculate the time to 5 m. 21 points on the body were manually digitized and used to analyze kinematics. Temporal, angular and kinematic variables were analyzed in this study. The kickstart allowed for significantly shorter time on the block and faster time to 5 m. If achieving the greatest speed off of the blocks and into the breakouts is your main goal, then the KS is superior to the GS. The KS requires a starting block with a back plate, however, a track start may also lead to similar benefits over the GS. The aim of this study was to analyze the mechanics of rotation and the temporal, angular and kinematics variables during the aerial phase for the kick-start with respect to the grab start. Nine elite swimmers (70.0 7 7.7 kg; 178 7 9.4 cm; 24.5 7 5.3 years; 824 7 119 FINA points scoring) performed the starts on the OMEGA OSB11 starting block followed by 5 m gliding at maximum velocity. Nineteen comparisons of kinematics variables across start technique were performed with critical alpha adjusted using a Holm’s correction to maintain an experiment-wise type I error rate of p o0.05. The differences were statistically evaluated by T-test and Wilcoxon test. Significant advantages for the kick-start were observed in all temporal variables (except in the flight time) and in the vertical take-off velocity. Similarities in the center of mass angular momentum at take-off (120.89 7 17.66, 126.61 7 13.51 s-1.10-3, p-value o0.294; kick-start and grab start) caused that KS did not increase the temporal advantages obtained on the block at 5 m distance. Two different rotational movements were found for both techniques. A displacement of the rear leg and front leg on the block and during the flight respectively permits a higher lower limbs position relative to the trunk at hands entry for kick-start. However, larger rotational movement of the trunk characterized grab start. It was concluded that shorter block times and rotational displacements of the lower limbs on the block and flight phase are the key of the best performance for kick-start at 5 m distance. kick-start performance. Journal of Biomechanics. 49; (2016) 1789–1793.